You don’t have to wait long to see the results. Oil skimming can have an immediate and sustained impact on your business. In fact, a Brill® tube-type oil skimmer can pay for itself within a few months through process efficiency gains, new revenue streams, and reduced equipment and labor costs. In this post, we look at seven key differences you’ll notice right away once you begin skimming and separating oil from water. If oily water reaches your wastewater treatment system, it’s often much more expensive and time consuming to treat it, requiring coagulants, polymers, vacuums and absorption materials. 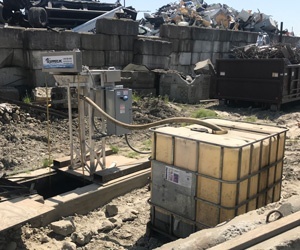 By skimming the wastewater earlier, you minimize the accumulation of sludge in your system, and thereby, the amount of chemicals, other wastewater treatment equipment and maintenance needed to keep your plant running at optimal efficiency. If oil is removed from the water close to the point of discharge, its original properties can be preserved. If skimmed onsite at your facility, both the oil and the water can then be reused at a fraction of the cost of buying fresh. In the day-to-day, this means less of each material will be needed to sustain operations, helping you realize significant cost savings and environmental benefits. Don’t need the refurbished oil yourself? Manufacturers of biodiesel, soap, animal feed and other products will commonly purchase it—providing a new revenue stream for your organization. Keeping tramp oil (hydraulic oil, lubricating oil and greases) out of the coolant in machine tool manufacturing plants is nearly impossible. If untreated, the materials combine to form a sticky substance that clogs lines and spray nozzles, stains products and leaves a smoky plant atmosphere. By continually skimming the oil, you’ll see improved working conditions, while extending the life of your coolant. You’ll also be able to dispose of the coolant easier, as ultra filtration and distillation become more efficient if the tramp oil is pre-separated before the process begins. Once cleaned of oils, coolants can cost-effectly be removed by waste haulers or put through an evaporation process to remove the water content. Large oil droplets get caught in filters easily, requiring frequent changing and/or signaling the need for replacements. Skimming helps alleviate this challenge, so you’ll notice fewer maintenance requests and downtime. Oil in wastewater is a breeding ground for bacteria, which if left to linger can cause foul smells and unhealthy working conditions within your facility. Nobody wants to work in the sludge. Your employees will immediately thank you for removing the smoky plant atmosphere caused by coolant-tramp oil mixtures, and the foul smells from bacteria. They’ll also be at less of a risk for skin disorders, commonly caused by the bacteria that grows in oil-filled wastewater. Because oil skimmers require little to no supervision, plant personnel can redirect their time to more profitable tasks and responsibilities. No longer is their time spent monitoring sludge or oil buildup within the facility and equipment. As demonstrated in this post, the positive affects of oil skimming are far reaching, including streamlined operational processes, simplified day-to-day maintenance, reduced costs and improved working conditions, among others. Start realizing these benefits today! Contact Oil Skimmers today to discuss your unique challenges, and learn how oil skimming can become a critical piece of your wastewater treatment process.